WE are Easter people and Halleluiah is our song. Today, we begin another chapter: the season of Easter. Yesterday Jesus lay entombed in death—but now no more. He is risen, and a new story is about to unfold! Easter changed everything in the world. The resurrection changed the whole human story. Now we are Joyful people. Halleluiah is our song. E=Empty tomb: He is risen! He is not here. 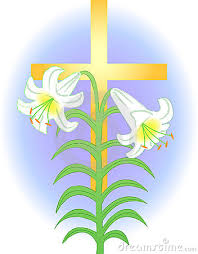 That is the message of Easter..
A= Appearances: Jesus appeared and people began to believe. S=Salvation: By fulfilling His promise, he gave salvation for all by his death. T=Transformation: The fearful apostles became fearless. E=Existence of the church: Church began on this empty tomb. R= Rite of baptism: People began to receive baptism. Our fish fry was awesome! I really enjoyed your commitment and cooperation. WE really show the world that we are Easter people sharing joy! During the last fish fry, I had the privileged to take MQH fish to a homebound elderly couple and to a family of 5 children whose father died last month. I am thanking the Sturpe family for taking that leadership to share that joy with less fortunate. Our parishioners and fish fry volunteers are awesome! In a special way, we must welcome our newest Catholics who are received into the Church at the Easter Vigil. I want to extend special words of thanks to those who have made our celebrations so special over these last few days. Our musicians, choirs, and cantors… our servers and lectors… our ushers and welcome ministers… our extraordinary ministers of Holy Communion, our parish staff… those who made our sanctuary so reverent and festive…and many, many more people. Many thanks! 1. Reflect on the resurrection. 2. Praising the name of God. Our God is an awesome God! 3. Cultivate thanksgiving. You can also begin to share what you’re thankful for on social media, or with your friends for next 50 days. 6. Smile. smiles increase joy, even if you’re not feeling it. Here’s another crazy idea. Ask God to make his face to shine upon you and through you. 7. Enjoy what you love: whether that’s hiking, eating ice cream, or listening to your favorite tunes. The 50 Days of Joy Challenge has already started. It’s not about how well we can perform, it’s not about creating a fake facade of joy, it’s about rejoicing in the joy of the resurrection and asking Jesus to fill us with his Spirit of joy. May we become a people known for our joy during Easter this season!